From a post card, but I think this is the Camp Infirmary, since that note is hand written on the back. The calender seems to say 1936 or 1938, given other notes in the Album I think it must say 1938. The calender is by a company Kooncay ( ? very unreadable ) Merc Co and is a painting of oxen pulling a connestoga style wagon. The photo on right is a pretty woodlasnds waterfall, one wonders if it is from the area. The cabinet contains hand labeled bottles and the examination table has on it a steel container and jar which probably has swabs or such. Note the bandages and scissors on the wall, I image cuts and sprains were the standard injury. 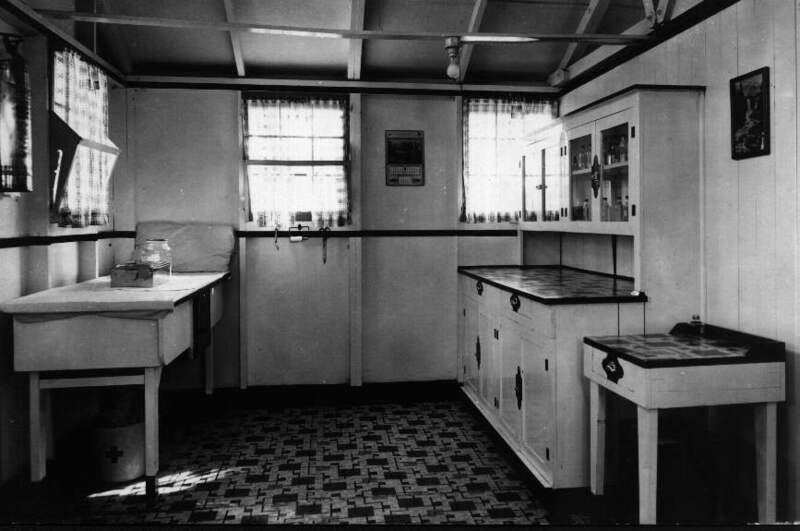 Also note the clean but crude contrustion with a two by four and metal cased wire providing the light fixture and the linoleum tile both on the floor and on the counter tops.